With an offshore fishing charter, anglers can expect to catch the fish of their dreams. 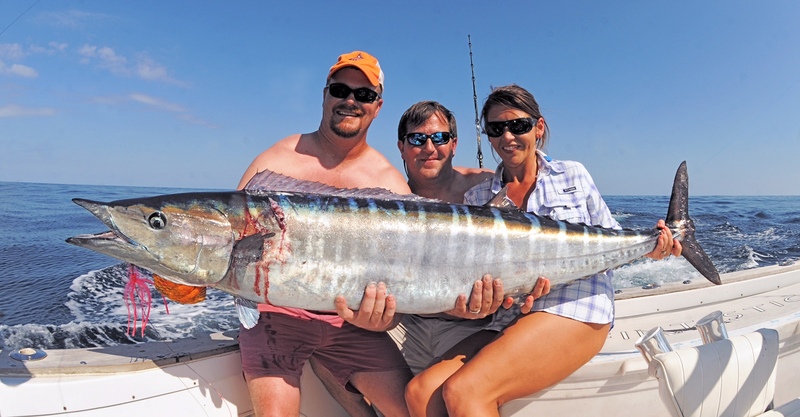 Whether you are struggling to tame a dancing sailfish, tugging on a stubborn amberjack, sight casting for cobia, or finessing a thirty pound king mackerel to the boat on light tackle, your angling dreams can be realized in the offshore waters of South Carolina! Offshore opportunities include sailfish, dolphin (mahi mahi), king mackerel, cobia, amberjack, blackfin tuna, barracuda, sharks, sheepshead, grouper, and snapper. Trips available are half days and full days. Fishing techniques include trolling, live baiting, and bottom fishing. Anglers can expect to run from a few miles offshore to all the way to the Gulf Stream depending on the length of trip and time of year. Fishing techniques include trolling, live baiting, jigging, and bottom fishing. Due to the new fisheries regulations on bottom fish species, you may or may not be able to keep many of the grouper and snapper species depending on the time of year. So “EXPECT” to release any species that is not in season. The days of filling every cooler on the boat are gone! I will under no circumstances keep any fish that is not of legal size, over the bag limit, or under a federal or state fisheries closure. I do not necessarily agree with all of the fisheries regulations, but I do obey the law! I will however do everything I can to give your friends and family a fun and productive fishing trip. Thank you for your understanding so we can continue to have the great fishing for our generation as well as our future generations. Deep Sea Fishing Tips to Make your Day More Enjoyable. If you are prone to seasickness I recommend the Scopolamine Patch that can be prescribed by your doctor. Other common seasickness remedies include Bonnine and Dramamine. I also recommend start taking these medicines the night before, because it will be too late when you get seasick! Small Children do not do well offshore and often get seasick, so I recommend that they at least be over 10 years old before they go offshore. 5% Processing fee for all credit card transactions on fishing trips and cruises. American Express, MasterCard, Visa, and Discover Accepted. A credit card is required to make a reservation. Cancellations due to weather are at the discretion of the captain and are fully refundable. Cancellations due to mechanical failure are fully refundable. Cancellations within seven days of the booked date will be charged 50% of the charter rate. No shows and cancellations within 24 hours of the booked date will be charged the full amount of the trip. ** Kids of all ages are welcome, but count as an additional passenger. Tackle, bait, fish cleaning and fishing licenses are all included in the charter price. Bring your own food and beverages, they will not be provided. There is a marina store and deli located at the marina for all your trip supplies. Please no glass containers, only aluminum and plastic containers. Please only wear boat shoes and tennis shoes without black soles, please avoid black soled flip flops they mark the deck the most! Please avoid all spray on sun block products; they can permanently stain surfaces on the boat. Bring non spray on sun block, polarized sunglasses, and a hat if needed. Boat is equipped with all required USCG safety equipment. Captain is licensed and insured. Catch and release fishing is strongly encouraged! A parking pass for the marina is included in the charter price. Please only one cooler per party! Tipping is customary and greatly appreciated. Google Maps Directions Click here! My Inshore/Nearshore/Offshore boat at the Isle of Palms marina is located on the left side of the fuel dock below the marina store. When you pull into the marina please park on the right side in the places designated as “Daily Parking”. A parking pass will be provided for you.